Enjoying Oikos yogurts? 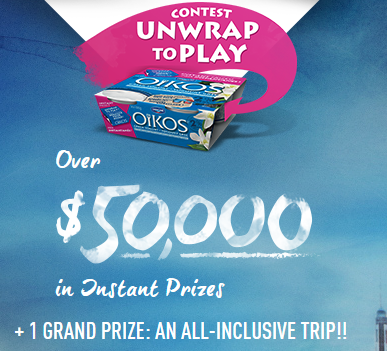 Participate in the new Oikos Unwrap contest (at Oikos.ca/Unwrap) running until December 23, 2014. Oikos is offering over $50,000 in instant prizes. To participate in the Oikos Unwrap contest, go to Oikos.ca/Unwrap, register for the contest, submit your unique code and spin the wheel. Every 4th code entered adds your name 50 more times to the Grand Prize draw. If you have trouble finding the unique code on your Oikos packaging, you can get a free unique code on this web portal. Get your code and return to Oikos.ca/Unwrap! An all-inclusive trip with the Lolë White Tour to a dream destination: flight, hotel, meals, two VIP tickets for the Lolë White Tour. The details about the White Tour can be found right here. Our team was not as lucky. We only got some Oikos coupons! It's better something than nothing. Update: Now Oikos allows you to participate without any bought product required. Claim your free participation code here.